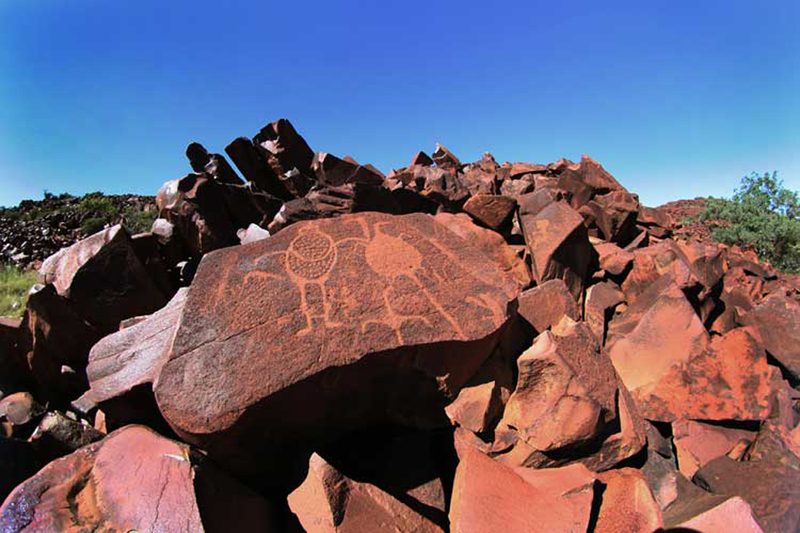 Murujuga Marni – The Burrup petroglyphs in context. Is Australia’s oldest rock art under threat? Dr Ken Mulvaney, archaeologist and cultural heritage specialist, presented a compelling lecture on Wednesday afternoon this week at the Victorian College of the Arts, during Wilin Week, the annual celebration of Aboriginal and Torres Strait Islander cultural diversity. Dr Mulvaney spoke of the extraordinary rock art of the Burrup / Murujuga Peninsula, a site estimated to contain more than one million petroglyphs (ancient rock art carvings), and the threat industrialised expansion poses to this significant cultural heritage landscape. Dr Mulvaney gave an overview of the history of the Burrup Peninsula / Murujuga, which is part of the 42 islands that make up the Dampier Archipelago on the far side of Western Australia, 1255km north of Perth (so named after William Dampier, the first Englishman to explore Australia in 1699). With European settlement in the 1860s came commercial exploitation (pearling and whaling) and industrialisation of the area. This period also saw the devastating introduction of small pox to indigenous people in 1866 and the genocide of the inhabitants of the Dampier Archipelago by police in 1868, known as the Flying Foam Massacre. Dr Mulvaney noted that it appears local Aboriginal people stopped practising their culture around this time, which is reflected in the cease of rock carving during this period. A remarkable and unparalleled cultural landscape, the Dampier Archipelago is thought to provide a unique record of human culture that dates back 30,000 years. The rock art traces periods of change in the environment, possible representations of now extinct megafauna species and depictions of technology and cultural practices. I found the engravings that are believed to be early images of the thylacine (Tasmanian tiger), the procoptodon goliah (giant kangaroo), the thylacoleo (marsupial lion), the genyornis (giant emu or ostrich-like bird) and the zaglossus hacketti (giant echidna) fascinating. Dr Mulvaney theorised that one particular thylacine engraving with a series of lines radiating out from the body of the animal may have formed part of an Aboriginal maintenance ritual to protect the species, in response to the declining numbers of thylacine. These beautiful engravings are surviving signs of times of climactic change in Australia, including the Ice Age and rising sea levels; Dr Mulvaney noted the dramatic appearance of marine subjects, which are distinctly different in style to earlier petroglyphs. It is possible one extraordinary rock depicts the phases of the moon, potentially counting the days until an event. Artists at the time carefully selected particular rocks which informed the shape of their drawings, sometimes utilising voids in the rock to create the features of a face or allowing the natural undulations of a rock surface to form the ripples produced by the flippers of a turtle. Some images have been added to and built up atop others by different artists over time. The petroglyphs record developments in technology, including axes, spears, fishing nets and lines. They also depict cultural continuities through time, such as a shift in use of the boomerang, from technological implement and weapon to clapsticks in the hands of figures. Once highly visible in the distinct red rocky landscape of the Burrup / Murujuga Peninsula, the petroglyphs have become weathered and worn over time and the continued industrialisation of the 1960s on the peninsula pose a serious risk to this significant site. Successive Western Australian (WA) state governments took ten years to develop a management plan for the development of a national park, which only covers a small portion of the area, leaving the remainder of the landscape unprotected. Despite recognition that areas of the peninsula are on the National Heritage list, parcels of land are earmarked for ongoing industrial development including hard rock quarrying, natural gas plants, fertiliser plants and salt lakes. Dr Mulvaney emphasised throughout his lecture the urgent need for continued research into the rock art of the peninsula, and concluded with a sense of frustration and dismay at the WA state government’s refusal to recognise the importance of this sacred, living landscape. A representative from Friends of Australian Rock Art (FARA) spoke briefly after Dr Mulvaney’s lecture, outlining the association’s work to protect and raise awareness of the threat to the petroglyphs of the Dampier Archipelago. Their website can be found here and details of the once-yearly FARA tour of the Burrup / Murujuga peninsula can be found here (running from 2–10 August in 2014).